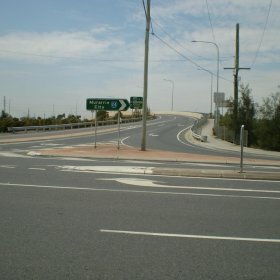 Intersection of Lindum Road and Lytton Road. Intersection of Export Street and Pritchard Street. Intersection of Port Drive and Tanker Street. Traffic Signals and Street Lighting Design. Contract Documentation, Specifications, Annexures and Cost Estimate. Supply 3d Design Model to Construction Contractor. Managing client, local government and community expectations. Managing Public Utility Plant protective treatments or relocations. Predicting future traffic movements / volumes for the future design life. Designing to maximize compatibility between the interim and ultimate designs. Widening an existing light weight fill structure constructed using foam blocks.